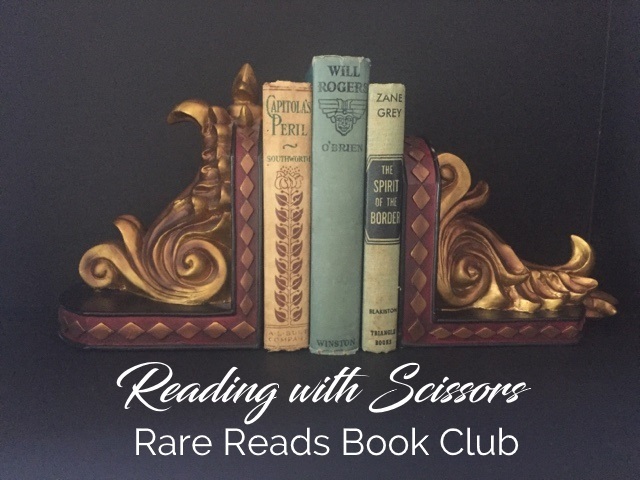 Reading With Scissors: Rare Reads Book Club: Where's Capitola? 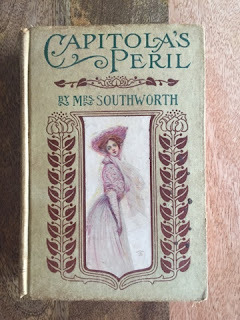 Rare Reads Book Club: Where's Capitola? Here we go. Book Club post #1! "At nine o'clock the next morning Traverse went to the library to keep his tryst with Colonel LeNoir." That, my friends, is how you start a sequel! No dilly-dallying with those who haven't read the first book. If you're going to read this book, then you better know what happened on the last page of the first book. But even if you didn't read the first book, you can't help but be drawn in by the drama on the very first page of this one, right? Some guy named Traverse tells this Colonel LeNoir that a lady named Clara Day is staying at her childhood home with her old companion, Marah Rocke, based on the deathbed wishes of Clara's father. LeNoir accuses Traverse of wanting to keep the heiress for himself—ah! she's an heiress—and that maybe he isn't being totally truthful. To which Traverse says how dare you, and LeNoir says how dare you back. At which point I'm asking myself, wait, isn't this supposed to be about someone named Capitola? So then comes the reading of the dead father's will and when nothing is included about Clara staying put, LeNoir says ok, she's coming with me to my place called (cue ominous music: dun dun dun) Hidden House. And then the doctor that brought the will to the house says now wait a minute, I was there when the good man died, and and I testify that he wanted his daughter to stay with Mrs Rocke PLUS did you know that Clara and Traverse are engaged and the recently deceased daddy knew and approved? But LeNoir (cue maniacal laughter) says she ain't staying and she sure ain't getting married; she's coming with me. Then Traverse Rocke (oh yeah, I forgot the part where we find out that Traverse is Marah Rocke's son) says not so fast, I'm going to take this to Orphan Court in the morning. So the next morning everyone heads to Orphan Court, and after 3 hours the judge sides with Colonel LeNoir. Gasp! After a tearful goodbye and a pledge to stay faithful, Traverse and Clara split, and LeNoir deposits Clara into his carriage and takes off. Despondent Mrs Rocke heads back to her cabin, and heartbroken Traverse takes off to bide his time in the West. And holy schmoley that is just Chapter One! Well-known fact (and if you didn't know it before, you know it now): The author E.D.E.N. Southworth was known for her sensational plots. Lesser-known fact: Her contemporary, Louisa May Alcott, made fun of Southworth for that very thing in her book, Little Women. Check this out from Chapter 27, where we find Jo stealing a look at a newspaper held by a boy sitting next to her. Pausing to turn a page, the lad saw her looking and, with boyish good nature offered half his paper, saying bluntly, "Want to read it? That's a first-rate story." Jo accepted it with a smile, for she had never outgrown her liking for lads, and soon found herself involved in the usual labyrinth of love, mystery, and murder, for the story belonged to that class of light literature in which the passions have a holiday, and when the author's invention fails, a grand catastrophe clears the stage of one half the dramatis personae, leaving the other half to exult over their downfall. "Prime, isn't it?" asked the boy, as her eye went down the last paragraph of her portion. "I think you and I could do as well as that if we tried," returned Jo, amused at his admiration of the trash. "I should think I was a pretty lucky chap if I could. She makes a good living out of such stories, they say;" And he pointed to the name of Mrs. S.L.A.N.G. Northbury, under the title of the tale. "Do you know her?" asked Jo, with sudden interest. "No, but I read all her pieces, and I know a fellow who works in the office where this paper is printed." "Do you say she makes a good living out of stories like this?" And Jo looked more respectfully at the agitated group and thickly sprinkled exclamation points that adorned the page. "Guess she does! She knows just what folks like, and gets paid well for writing it." Here the lecture began, but Jo heard very little of it, for while Professor Sands was prosing away about Belzoni, Cheops, scarabei, and hieroglyphics, she was covertly taking down the address of the paper, and boldly resolving to try for the hundred-dollar prize offered in its columns for a sensational story. By the time the lecture ended and the audience awoke, she had built up a splendid fortune for herself (not the first founded on paper), and was already deep in the concoction of her story, being unable to decide whether the duel should come before the elopement or after the murder. Trash? S.L.A.N.G. Northbury? Thickly sprinkled exclamation points!?!?! Don't you love being in on the joke? Anyway, we're on to more fun next time. If you haven't started reading yet, download your copy here. Here's a preview: Capitola actually shows up in Chapter 2!!!!! !